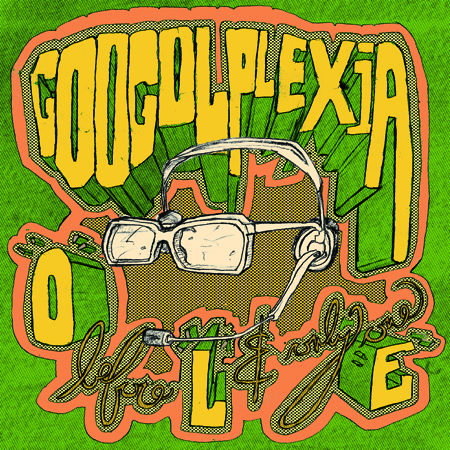 PP 009: Googolplexia - "O" Before "L," And Only One "E"
The first official Googolplexia full-length includes nine tracks newly-recorded with Glenn Burleigh, followed by two tracks recorded previously with Mike Stasny (who also designed the cover art) for miscellaneous purposes, followed by the seven tracks that have always been available on this website as the Shawn Yates Mixes of Live In The Studio March 2004. Nine new tracks, nine bonus tracks, full-color artwork, hand-numbered (in a limited edition of INFINITY!) and hand-wrapped by Googolplexia himself! Order the CD for $6 postage paid by clicking on the cover image below. That's three songs per dollar! The new recordings are songs that I hadn't intended, necessarily, for whatever big official gigantic Googolplexia LP one day becomes released, but songs I wanted solid recorded versions of nonetheless. Glenn got a ProTools rig and asked if I wanted to record some demo material, and I figured it was a great opportunity to lay these songs down in recorded form. "Undead" is a song originally by Iowa City's Miracles Of God (featuring Samuel Locke Ward). "Brownie Girl" is a song originally by The Transmutors, a local band whose members' identities are unknown to me and whose band pretty assuredly no longer exists (I changed the lyrics a little bit, and don't exactly remember right now what the original lyrics are on the part I changed, oh well!). "Ballad Of Paladin" is the theme song to the old TV show Have Gun - Will Travel, originally sung by Johnny Western. "Country Strong" is an excerpt of a song of the same name from a Gwyneth Paltrow movie also of the same name which I performed live at Bass Pro Shop as part of a contest - you can see the footage from that here. "A Little Bit Of Soap" was originally done by the Jarmels in the early 1960s, and "I Second That Emotion" is of course a Smokey Robinson & The Miracles classic. The other three songs are my own compositions. Slow Rocket Urban Farm was an urban farm run by my friends Jaffa and Joss in the 1900 block of Cherokee Street in Saint Louis. I don't think it really exists any longer, but I did perform that song once live at the farm itself. The other two songs are raps I would sometimes do with the help of the CasioBot 9000. C'est Une Affiche was originally featured on PP 000 (Pancake Productions Summer Sampler MMX) and Lovesick & Sick Of It (a Fantasy Four original) was recorded for a Saint Louis Secret Sound Society project and later featured on the Dudes Magazine March 2011 compilation Dude Sounds. Since I photocopied the artwork at the library (a cheap place to get color copies made, assuming you aren't super-picky about how they turn out), it is a little different in person than it appears here. No biggz, I'll take the 30¢ color copies. As a bonus, you can get 8.5x11 OR 8.5x14 for the same low 30¢/copy price, so this is also where I made my tour posters. Heckfire, I'll probably toss a copy of this in with an order for just about anything else from Pancake Productions.